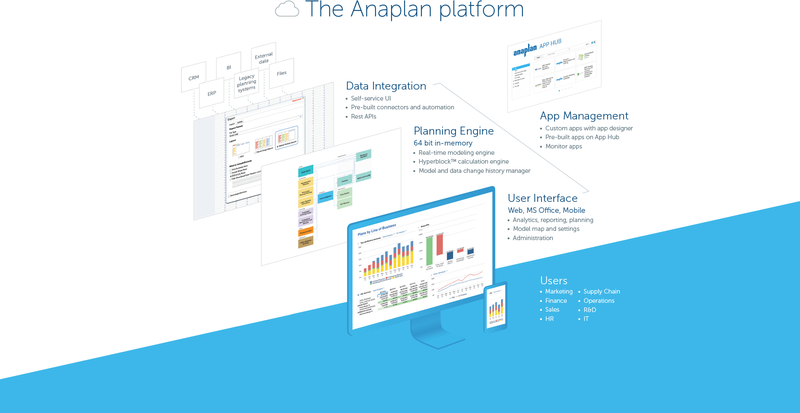 Because it is flexible, Anaplan is well suited for complex global organizations. We are a multi-matrix organization therefore, having the ability to establish multiple hierarchies in data hub and use those to slice and dice in the spoke models improves efficiency and accuracy. We are in the early stages of our implementation therefore, we are yet to encounter scenarios where Anaplan is not appropriate. My guess would be that if you have a small company with little complexity, then you might consider a less powerful tool. They are more suited to growing, nimble companies. They are soon adding employee approval to time cards and checkin by facial recognition. Additions and changes to improve functionality might not work for a very large company like GE. Hyperbloc architecture -- the ability to see changes to models instantly cascade through all the models. Function agnostic platform - the ability to adapt the platform to many different use cases and integrate those use cases into a connected planning environment. Cloud architecture. Security and product enhancements come automatically. APS OnLine is a great end user product and very easy for our employees. They have quick access to all their information, their accrual balances, hours worked, etc. They are able to enter their time off requests in the system. Although our prior system had these capabilities, employees had difficulty accessing system. If they couldn't get in, they couldn't use it. More employees logged on to APS in the first two weeks of use than in the prior three years with former system. Integration - Data is real-time. When you enter information in one area of the software, it is immediately present in the rest of the system. No waiting for overnight interface. Change log provides backup for any changes that have been made as well as safeguards in the approval process. Administrative ease - The system is very straight forward, logical, and easy to operate from the administrative end. [There is a] designated representative to address questions as they arise. No sitting on hold. As models get larger, there is definitely some lag in the calculation. This can get annoying for end users when they are using dashboards. Sometimes there is too much flexibility -- can lead to wanting to use Anaplan for things that it wasn't explicitly designed for. Reporting is still limited in some ways, more color options for example would be nice. 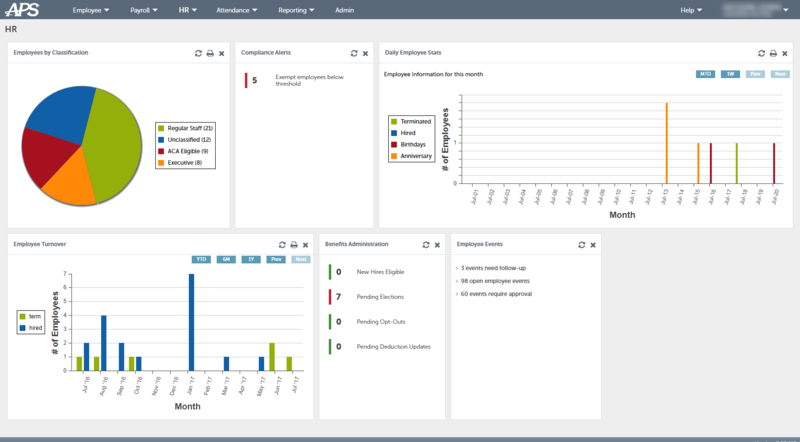 State by state rules - In a few states that we work in they have very strict rules on overtime, sick leave, etc and APS didn't have the time and attendance pre-configured correctly for these. Their development team has really worked with us to handle it but it just took a bit longer. Overall though they have been very upfront about it and have been able to make the necessary changes. No scheduling - I think this is something in development right now but I know that other larger companies do have this capability. It would be great to have but it truly hasn't "hurt" our ability to do payroll. In general, it's a great system to use. We were looking for simplicity and ease of use and have received raves from our employees in their ability to access and make use of the system. There is still so much more that we have yet to gain as we continue working through each of the modules. There is one primary account representative that we contact on a regular basis. If she is unavailable, there are others on her team. It does seem that our implementation was more complex than others that have been installed, so fixes are not as easily remedied. Even if it wasn't in-person on location, we felt like we had our trainer in the room with us. I won't rate this low due to the 3rd party consultant, because overall the implementation with Anaplan went great. We had working models in our first month of having Anaplan, and have been able to branch out into multiple facets of the business in the 3 years since our first implementation. It would have been helpful to understand the phases of the implementation up front so I could have prepared differently for enrollments, billing, and transfer of information to payroll. At the end of the day, I'm happy with the selection and the system and anticipate I will like it better as we go along. We have done a number of other system implementations in the past few years, and this has been pretty painless, however, I've had a few surprises. Better functionality. Not as slick looking. I've never had a problem with the system nor in finding the right information. The change to APS Online will decrease the time spent preparing and processing payroll. The most important improvement will be the integration with the payroll and HR modules - this will save a tremendous amount of redundant work. Our Payroll solution is offered as a standalone service, but additional solutions must be used in conjunction with our Payroll solution. This ensures the best possible user experience for our customers.